I did my first ever buddy read with, the sweetest girl ever, Adaline (Not Gary Cooper). She's such a cool chick bookaholics, I highly recommend checking out her blog. 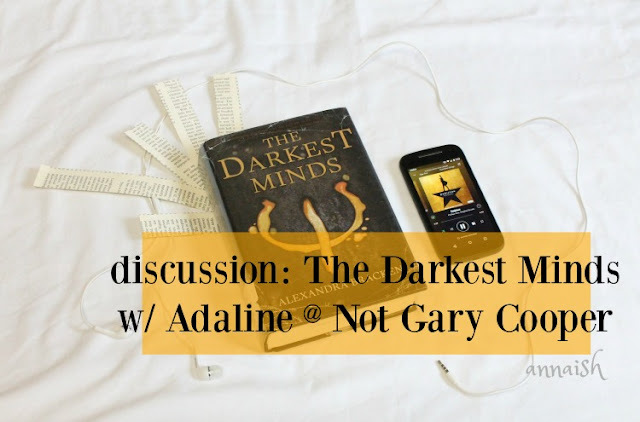 Anyhoo, we both read The Darkest Minds by Alexandra Bracken ... back in October. I made discussion questions back then but we both got caught up with school, personal stuff and our bl- we never finished them. But today is the day! We finally finished our discussion and we now hope you enjoy our little chat. Note: Our discussion does including minor spoilers so read at your own risk! Also I just wanna point out that Adaline's answers are on point so just excuse my meme-ish answers. Hope I give you a good laugh though! 1. First off, what color would you be? ADALINE: Kids in the TDM world are sorted in base camps by colors; which correlate to their abilities. Red- pyrokinesis; Orange- mind control; Yellow- power over electricity; Blue- teleknesis; Green- super intelligence. I'd probably wind up being a green, only because I spend so much time shoving facts and schoolwork into my head-- but I do think being a yellow and having power over electricity like Zu did, would be amazing. ANNA: Blue! I feel like the Blue abilities would fit me best. 2. Favorite character (so far)? ANNA: Oh definitely Zu. She's a rebellious little girl yet a sweetheart. 3. If you were an adult in this world, how would your story play out? ADALINE: The first answer that popped into my head was, "Dead, tbh." In all seriousness though, I feel like I'd be that ever skeptical adult not really believing the government/what others were saying. I'd probably wind up making my own conclusions, and trying to help the kids I came across as best I could. "NO NO ... WILL! YOU CAN'T TAKE MY WILL. NOT MY WILL!! WILL SWEETIE W I L L!! "oh yeah you can take that mutant kid. just take a left and down the hallway ,, third door." I'm going with me as a "NOT MY WILL!!" parent. 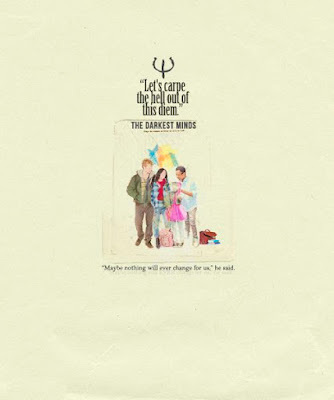 ANNA: “The Darkest Minds tend to hide behind the most unlikely faces." 5. Rudy and Liam's relationship ... thoughts? ADALINE: I wasn't majorly shipping it, and the insta-love aspect had it's cringey moments​, but I liked their kind of mutual respect for each other, and how their relationship progressed as the book unfolded. I do think Liam may have suffered from a little bit of being too perfect? I feel like most people when placed in an apocalypse style setting wouldn't be half as open or caring as he was. It felt a little odd at times. But overall, not too bad. 6. Do you have any fancast ideas for the main characters? 7. Thoughts on the movie adaptation? ANNA: I am loving the casting for this movie adaptation! I have high hopes. Exciting stuff! 8. Do you have any possible theories in the next book, Never Fade? ADALINE: Certainly Ruby and a certain character have to meet up again, because there is no way I can accept that ending. I think Ruby will definitely find her way out of her current situation. I don't know?? Perhaps she makes her own camp + hunts down kids to protect them? I want to see more of her powers, that's for sure, because I really enjoyed that element of TDM. ANNA: Not really. I just hope that the black betty crew™ find each other again. 9. Are you planning on continuing this series? ADALINE: At this time, I can't see myself picking up the next book for a while. The Darkest Minds was one I kind of slugged through, with regards to the writing style, so if I do pick it up, it'll probably be later in the year when I'm not trying to get ahead of my reading goal. 10. Finally, were you satisfied with this book? ANNA: I was! I found The Darkest Minds to be a somewhat cliché dystopia but also found myself enjoying it. 4.5/5 stars! I'm starting to realize that me and Adaline both slyly mention Stranger Things here haha. Thanks for reading our discussion fellow booknerd! You can check out Adaline's post here and, I must ask, have you read 'The Darkest Minds'? Could you relate to any of our answers? Let's chat! but in all seriousness-- this was so much fun, and i can't thank you enough for doing it with me! <3 we'll have to do it again sometime! AHH YES. Glad to see you enjoyed it! I'm so tired of Dystopian, but this series reminds me of my love for the genre. It's really unique! Zu is also my favorite characters, and like Adaline, I also find Liam too perfect and don't ship them together that hard. Love this post! Oh much agreed!! Thank you, Tasya!